Mr. Nashville: FIND OUT THE LATEST ON BIG & RICH, MARK CHESNUTT, DOLLY PARTON, KENNY ROGERS, PARMALEE AND MANY MORE IN LATEST EPISODE OF "THE PICKUP"
NASHVILLE, Tenn. – Continuing the tradition of bringing you the latest news in country music, an all-new episode of “The Pickup” starts out with the announcement of a new album by Big & Rich.Did It For The Party will be the duo’s sixth studio album and is set to hit stores on September 15. With summer in full swing there is denying that it is hot. Mark Chesnutt is feeling the heat with new music and, listen to this, new hot sauce. His newest single “Hot” is from his latest album, Tradition Lives. Mark Chesnutt Hot Sauce is available for a limited time. For more information visit markchesnutt.com. Christmas in July? That’s right. Dolly Parton is celebrating with the gift of an Emmy nomination for outstanding television movie for ‘Christmas of Many Colors: Circle of Love.’ Tune in when The 69th Emmy Awards telecast live on Sunday, September 17. Kenny Rogers is scheduled to have a special press conference in Nashville on Tuesday, July 18. “The Pickup” will be on hand, so stay tuned for the next episode for an inside look. “The Pickup” has some special news to share. It can now be seen on the websites of over 200 radio stations and television broadcasters around the world including WSM, RFD-TV and CM&T UK. Thank you everyone for making this possible! The newest edition of The Pickup and Coming features a special look at up-and-coming artist Brooke Woods’ single “God Bless the World.” Woods stopped by “The Pickup” headquarters and talked about how she got her start in music. As promised last time, “The Pickup” sat down with Charley Pride to discuss his career and his dedication to the music. The new duet album from Rhonda Vincent and Daryle Singletary, American Grandstand, gives fans classic country duets and never-before-heard original music. Both Vincent and Singletary stopped by “The Pickup” headquarters where they tell the story about how the project came to be - a random encounter between the two. American Grandstand is available now. 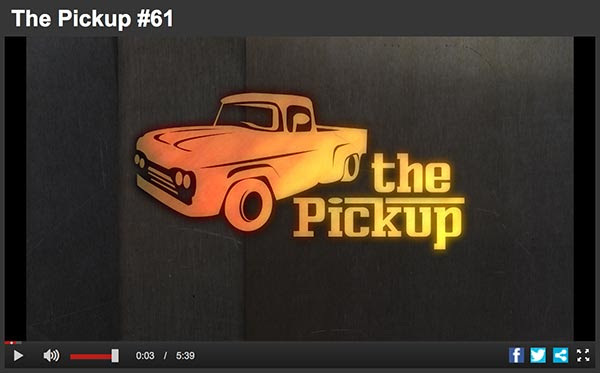 Watch the latest episode of “The Pickup” here.